Read our newly released 2016-17 Annual Report! High-quality early education experiences lay the foundation for school readiness by providing children with dependable, nurturing relationships and safe, stimulating environments that support healthy development. However, only 29% of the 23,000 children birth to age 5 in Durham County are enrolled in licensed, regulated child care programs, and there are more than 3,000 children currently on waiting lists for child care scholarships. This is a critical need in our community. In 2014, the median cost for an infant to attend a 5-star child care center was $1,234 per month. For the average family in Durham, child care costs for one child can add up to almost 1/3 of their annual income! This is why the Partnership makes it a priority to increase access to high-quality early education, particularly for low-income families. Last year, 842 children received high-quality early childhood education through Partnership programs such as Smart Start Scholarship (259 children), Durham Early Head Start (72), and NC Pre-Kindergarten (511). Thanks to new funding, we will serve an additional 105 children school this year through NC Pre-K (41 new slots) and Durham Early Head Start (64 new slots). We know that early education works. 94% of school readiness programs were achieved by Smart Start programs. 100% of NC Pre-K children received a developmental screening to identify support services needed to achieve school readiness. 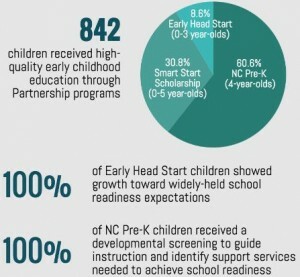 100% of Durham Early Head Start children showed growth across all domains of school readiness. Child care programs need resources, technical assistance, and professional development to maintain a high level of quality, which in turn leads to higher levels of school readiness for children. The Partnership works hard to support Durham’s child care centers in numerous ways. Last year, nearly half of all regulated child care facilities in Durham (158 out of 333) received services from the Partnership to improve the quality of care and support early childhood educators. 1,062 parents/guardians received child care resource and referral services, including 728 high-need families. Families who received child care scholarships and/or referrals to child care programs were able to access a higher quality of care than other families. A parent is a child’s first teacher. This important role is amplified when children are not in formal early education programs, and in fact, parenting style and the home learning environment are two of the most significant predictors of cognitive performance among young children. Engaging parents in ways that honor their expertise and build on their understanding of their children’s development is critical to school readiness success! The Partnership offers home visiting services, parent education classes, support groups, and many other services through our Smart Start-funded Health & Family Support programs. Last year, 98% of literacy program participants reported reading more to their children, and 85% of parents who received home visits improved or sustained positive parenting practices. 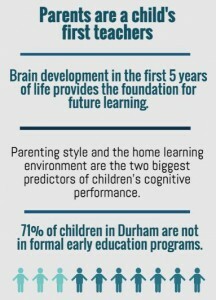 Durham Early Head Start (DEHS) also provides high-quality comprehensive services, including home visiting services, early intervention and mental health screenings, housing assistance, and parent education, among others. Last year, 49 men participated in Male Involvement Program activities through DEHS. Our Transition to Kindergarten (TTK) Initiative focuses on preparing both children and their families for the important milestone of entering school. Parent engagement is a key factor in a child’s ability to navigate school with confidence and competence. 100% of families who attended TTK events last year agreed that the activities helped them feel more comfortable about their children starting kindergarten. For more than 20 years, we have served as the convener and facilitator of Durham’s early childhood system, leading community strategies to respond to the needs of all children birth to age 5 and their families. All of the work that has been accomplished is a testament to Durham’s spirit of collaboration. Through Smart Start, Early Head Start, and NC Pre-K, we fund and work alongside high-quality, evidence-based programs, investing public dollars where there is a proven impact. And just like the young children we nurture, the Partnership is growing and developing too. As needs and issues arise in Durham, we adjust our priorities and our focus to better serve children and families, keeping our mission at the forefront: to ensure every child enters school healthy and ready to succeed. Some of our most groundbreaking work is in the community-based initiatives we have created, such as the Early Childhood Training Institute, which provides training for professionals who work with families with young children, and the Transition to Kindergarten Initiative, which helps prepare children, families and schools for the milestone of entering kindergarten. Most recently, we’ve formed an Early Childhood Mental Health Task Force out of a need for more support for children’s social-emotional development, and we’ve taken a lead in three new Collective Impact Collaboratives, funded by the United Way of the Greater Triangle. All of these efforts depend on deep collaboration with many community partners, organizations and institutions from all sectors in order to identify new ways to address the needs of young children and families. Click here to view a full list of current and past reports.